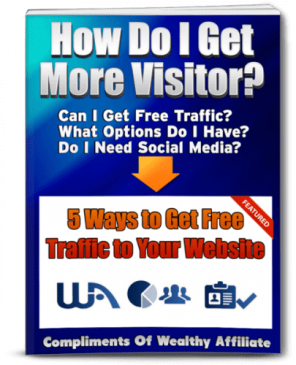 In this post I discuss 5 traffic methods to boost web traffic to attract more visitors, leads, subscribers, signups and sales to your marketing campaigns. 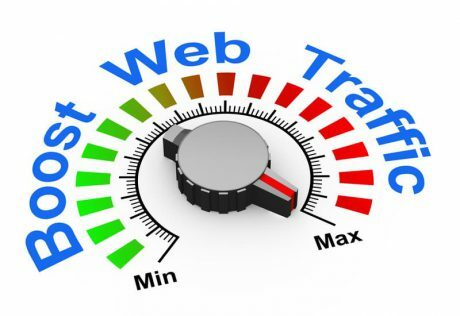 Website traffic is potential income. Nothing happens until people visit a web page. Then monetized links may convert into leads, subscribers, signups and sales. Ideally we all want hordes of qualified targeted visitors arriving to our landing pages from organic traffic. But it is risky to put all of our eggs into one Google search engine basket. History tells us that businesses have seen downturns and were even totally wiped out by changes that Google made to its ranking algorithms in the past. We do not have control over what Google does or doesn’t do. Similarly with social media. Most of us have heard of entrepreneurs who lost businesses overnight when their social media accounts were banned. Relying on something that is outside of our control and might work today but not tomorrow is risky. That is why I recommend a multi-channel approach to traffic building. The percentages below show my traffic goals and where I focus my traffic building efforts. Of course you should implement your own priorities. 1. SEO Free organic traffic – 30 percent. 2. Email marketing – 40 percent. 3. Social Media, Communities and Forums – 15 percent. 4. Blog Commenting – 10 percent. 5. Traffic Exchanges – 5 percent. After pausing work on my website, I learned that high search rankings don’t necessarily last. If not regularly publishing new content and keywords, search traffic can dwindle fast, even disappear. My search traffic decreased from 8.1 percent (not great to begin with) to virtually nil when I stopped adding new content to the site for 18 months. Unless you have a high authority site with lots of ranking evergreen content and searchable keywords, it becomes an ongoing process to keep search traffic flowing. Search engines love new content! In hindsight, I should have outsourced content writing during my absence. 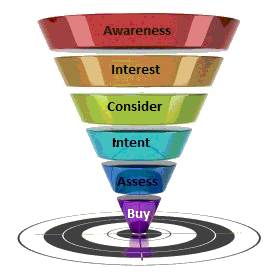 Selling a front end product is great, but a better long term strategy for any online business is to create a marketing funnel so customers come back to buy more. A product is not a business. A profitable business is about having paying customers. A direct sale is nice, but do you want to end your relationship there? Online this means using email marketing with an autoresponder to build a subscriber list and communicate with existing or potential customers who have opted in to receive information about your product. With an effective email marketing strategy, you can provide quality information relevant to your subscribers’ interests and build an ongoing connection with them. Check out my article here. Getting connected with social media is one of the fastest ways to share your content and is essential for networking. I use Facebook and Twitter. If you are new to social media, start with one until you learn how to use it and then add another when you are ready. Search the web to find forums and communities related to your passion or area of interest. Whether you’re a keen gardener, writer, graphic designer, sports fan, or interested in health, fitness, weight loss and hundreds of other topics, you will find a venue online where people with the same interest will gather to discuss topics related to your niche. Both email and social media marketing have a place in your marketing approach. Someone asked me if I had to choose between social media or email marketing, which method would I choose. My reply was that it is not about using one or the other but rather integrating both effectively. The questioner persisted: If you had to select only one, which one would be it? Pushed to the wall..lol…I replied that I would choose email marketing. Here’s why. Social media has mass appeal in many areas of our lives and is important to business. However, as at 2017, despite spam and inexperienced marketers ruining things and decreasing open rates, email marketing continues to have the edge for generating leads and loyal subscribers — when done right! Plus, an email subscriber list is an asset in your business. You own it. A social media account can be banned or shut down without notice. The source for the above data is available in this exclusive free report. The research surveyed 2,500 marketers from 126 countries across 19 industries on the effectiveness of email marketing. This is a relatively small sample compared to the tens of thousands of marketers worldwide. Nevertheless, the fact that it covers multiples countries and industries gives the results more weight in terms of trends. I signed up to receive push notifications from a few marketers at first thinking this is a great idea. I receive a small popup on my computer. Wonderful, right? Nope. I found them distracting. It is true that the view rate for push notifications has increased substantially compared to view rates for emails. But it wasn’t long before I started to get irritated when those notices popped into my computer screen. Push notices might get more clicks, but emails are more effective for conversions and total sales. When you look at an offer by being interrupted from what you are doing, chances are your mind is not in a receptive state. What are traffic exchanges? Basically these services allow you to exchange traffic with other website owners. You visit websites owned by others and they visit yours in return. Read more at Wikipedia. I use traffic exchanges for about 5 percent of my marketing. I point the traffic to either a splash page that sends the visitor to my site, or a web page that has a lead capture opt-in email form. If the visitor takes the next step to subscribe to my list, it shows some level of targeted interest. Most traffic exchange surfers are there to sell, not to buy. If you are in the internet marketing or make-money niche, then advertising in traffic exchanges in the right way can help you to build an email subscriber list. The audience are marketers, like you, who are interested in earning opportunities, resources and web tools. I see lots of people promoting direct affiliate program pages that everyone else is promoting. One can get lucky, but this is not the most effective strategy in traffic exchanges. If your business is in a niche such as dog grooming, healthcare or weight loss, your time will be better spent in places where those people hang out – forums, social media platforms and online groups – where the audience wants to connect with people who share the same interests. To sum up, the most effective use of traffic exchanges is to offer something free or low cost, capture the viewer’s email address with an opt-in form provided by a reputable autoresponder service. I had memberships in a few revenue share traffic programs a few years ago. I learned the hard way that most of those programs did not have a viable compensation model. They promise payouts on revenue they “hope” to earn, rather than on what in fact the site has earned. The pattern is usually something like this: First they announce a change in payment methods and that they have to move “offshore”. Then they reduce the frequency of payouts and lower the amount that can be withdrawn at any one time. Next, they advise that they are experiencing server problems due to the heavy traffic caused by the huge success of the site, which causes further delays in cashing out payments. Then one day, they disappear! If you are currently in this type of ad package surfing program, these are tell-tale signs that you should probably get out. I’d love to use traffic exchanges more, but they are not designed to build a blog readership. And promoting your website directly in them causes a high bounce rate in Google Analytics, as traffic exchange surfers are there to view a site for 10 to 15 seconds or less, which is not good for website rankings. For this reason, I create my own splash and opt-in pages that send the visitor to my main site. The traffic statistics in analytics show the source of the traffic as coming from referral traffic. I use this process to minimize the negative impact of visitors going directly to my website from the surf rotation bar in a traffic exchange. The bounce rate is a percentage ratio of how many visitors arrive at a website and how many leave after viewing only the one page they landed on. According to search engine algorithms, if someone does not click through to other content on a website, they must not find the site interesting. I don’t entirely agree with that assumption. The visitor may have found exactly what they were looking for and left because they got what they came for. More important than the bounce rate are conversion rates (clicks and sales). For example, someone might visit the review of my recommended program and sign up without visiting any other content. Bounced pages can make sales. Many traffic exchange users don’t care about bounce rates because the product they promote converts directly in the traffic exchange. Or they rely on email marketing to make the sale and use the traffic exchanges for list building and branding purposes. When those factors are taken into account, a bounce rate of 35 percent is acceptable. An 80 – 100 percent bounce rate on an ongoing basis will need attention if the conversion rate is low. Just because a visitor comes to your site and sees only one page does not matter if that page makes the sale! If the conversion rate (signups and sales) meets your goals then the bounce rate might not be a significant factor in your marketing methods. 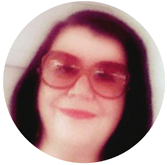 If you’re serious about having an online business and want to be educated on all aspects of it, I invite you to check out my profile and join us at Wealthy Affiliate. I have been reading many posts relating to this topic of traffic for blogger sites. The information you have provided and the way you explain it is one of the best and helpful. Keep on doing more of this. Thanks.